Is Gold cyclical? Is a bullish consensus in which 97% of gold traders are bullish justified? Will my theory of relativity work on the barbarous relic? Lets take a look. First let me explain my theory of relativity, basically it is based on the premise that there are multiple cycles in effect all the time and each cycle is subservient to the next larger cycle. This makes it possible to know where we are now and where we will go over time. In the thirty four year chart below you see two cycles, the big one (marked by red lines) is an 8 year cycle (*) and it is incredibly reliable, even the highs came in every eight years. 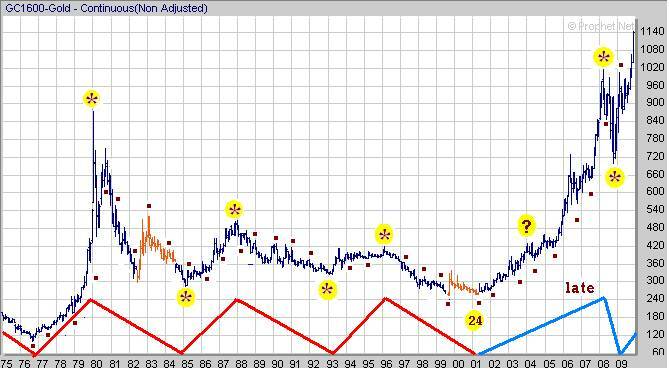 The other is our old friend the 1 year cycle (Brown dots). Notice that when the price rose above or fell below its previous 1 year extreme, it signaled a change of trend as the 8 year cycle turned. There are only two times in 34 years that there was hair on the cyclical lollipop. In 1982 and again in 1999 there was confusion caused when a break of a previous year's high was a false signal. I have highlighted those bars in red. Notice that the 1999 rally also led to the question of a possible shift in the 8 year cycle, it is barely noticeable as your eye and brain scan 34 years of data in a split second, but it caused a lot of confusion at the time. In fact it caused many analysts to miss the bottom last year. In shorter term cycles you see that happen more often, I call them compression turns. Still, two times in such a long span of time is not bad, in fact that is tradeable relativity! I have also marked in a tentative, very large cycle which I labeled as a 24 year cycle because we know it is a minimum of 24 years in duration, it could be larger. Notice that after the low in 1976 we did not break below a previous eight year low for 20 years, until 1997. Just as with the 1 year cycle, we can assume a larger trend than the 8 year cycle is in play and dominating the 8 year. Returning to the 8 year for a moment notice how consistent the tops were, coming in 3 years after the lows and 8 years from the previous highs, that is rarely seen at cycle highs. Then in 2004 when the next high was due, everything changed. We poked our nose above the previous 8 year high (? ), there was a nod of the head to the expected top, then bam, the gate slammed open and the bull was out of the chute. In the above chart I have changed the lines to blue as we began the new bull run, although it took several years to be confirmed. The relatively normal translation of the 8 year cycle was no more. Something bigger was pushing gold higher. In 2006 again there were expectation of a possible top because of how late we were in the 8 year, after all gold had never gone up so late into a cycle top before. Wrong again, the 1 year cycle never got touched and gold bolted to its ultimate late translation top in 2008. From there it clunked, shaking out many bulls as they either lost their nerve or were sold out on margin calls. As you see the 2008 top was very late. 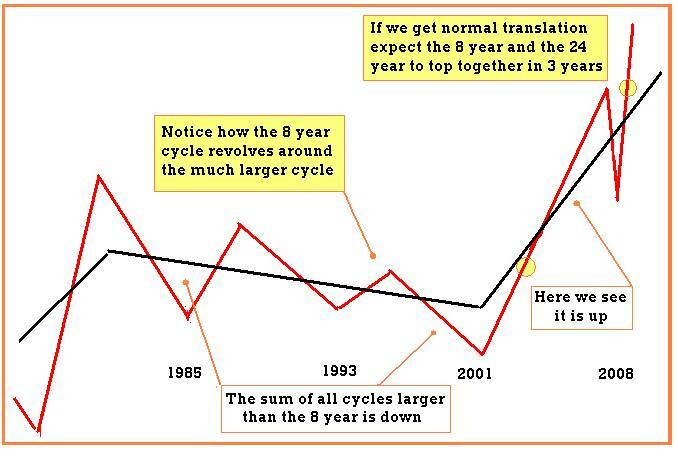 Late translation of the 8 year cycle usually is an indication that the sum of all cycles larger than 8 years are moving strongly higher. We can assume from this that at that 2001 low, the cycle we are calling the 24 year turned up and is now 9 years along in its up phase. The 24 year should not top out until 2012. Now look at the 8 year cycle, it has broken above its old 8 year high, confirming the up move is on track. Given normal translation, it also should not top out until 1012! The next thing we need to do is define what the 1 year is doing, we don't want it blindsiding us with a sudden clunk. Here it gets fuzzy, there is no clearly defined low to make a call on. Also there is a very strong seasonal cycle in gold that makes its lows in the summer and tops out in the February to March time frame, it also has to be factored in. What I have done is tentatively peg it as the low in late October, but I also realize it could come in anytime now as well. I also know that the fat boys are extremely short gold futures. So I guard our positions with stop loss orders and won't be surprised by a sudden melt down. If it has not been made yet, it has to be soon, before the end of the year. The new year should see more new highs into at least March. To conclude, the picture looks bright for the metals, I did not put in targets, but $1800 is one of proprietary objectives that seems easily attainable in the next 3 years of this cycle and possibly much higher. Shorter term we will see profit taking around $1300, it is the head and shoulders target everyone is watching. We will definitely attain that in the next 1 year up leg, which may have already started. Bob Clark is a professional trader with over twenty years experience, he also provides real time online trading instruction, publishes a daily email trading advisory and maintains a web blog at www.winningtradingtactics.blogspot.com his email is linesbot@gmail.com. 27 Nov 09, 14:38 It's Thanksgiving Weekend. Hi people, it is Thanksgiving Day! I'm happy with my extra day off, and I am planning to doing something fun that'll probably involve a moto trip and seeing something new in Plainfield I haven't seen yet.